One of the areas in which Kustodiev’s talent manifested itself clearly and distinctively is the portrait. Today, portraits of people well-known or dear to the artist are most interesting for us. Such portraits, spectacular and deep at the same time, prevail in Kustodiev. He especially readily wrote creative people: actors, artists, musicians. One of them – “Portrait of the composer D. V. Morozov”, donated by the Astrakhan gallery to the artist’s widow. It was created in 1919 in St. Petersburg, in the house, or rather, in the living room of B. M. Kustodiev, with whose family the musician had a long and warm relationship. In the State Russian Museum there is an outline for this portrait, made in the same year, 1919 and giving the opportunity to follow the course of creative searches. It is curious that in the 1920s composer Dmitry Vitalyevich Morozov, whose works were performed by the Petersburg court orchestra, was considered a “local” writer. In the newspapers of Astrakhan of this time we can find notes telling about concerts held in the city with the performance of his romances and symphonic poems. Sometimes he even conducted the Astrakhan orchestra. It should be noted that this work by B. M. Kustodiev is one of the most interesting images of a person at the time of creation. Morozov is assembled, a little excited, the internal tension of the composer is transmitted to us: now he touches the keys, and the room is filled with the melodic sounds of a new romance. 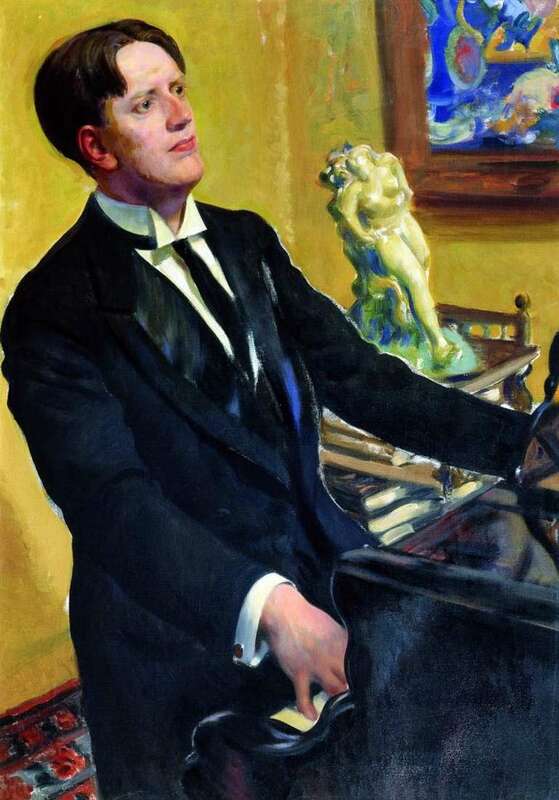 Description and meaning of the painting Portrait of the composer D. V. Morozov by Boris Kustodiev.